I'm a big fan of multiple monitors. I started out a few years ago with two monitors on my home rig, and then added a third. Frankly they were taking over my desk, but all that screen real-estate certainly came in handy. I thought my days of one-monitor living were gone for good. I also remember the first time I saw a curved screen on a TV. It was at CES, and I looked and looked and just didn't get it. Why the heck would anyone want a curved screen, with that additional depth. I called them a gimmick. Then I saw some of those curved, super-wide desktop monitors that cost well over a thousand dollars. I was similarly dismissive. But last week I finally got sick of my multi-monitor setup. One of my 22" monitors was on the fritz, and would often need to be restarted to come back to work. And they really had taken over my desktop. So I started shopping for a new pair of monitors. That's when I discovered Dell's 34" curved double-wide monitor on sale for under $700. I compared the specs of the 3440 x 1440 screen to two other 24" monitors I was considering, and the prices were comparable (especially after a $70 mail in rebate). And I did the math. Sure, 1920 x 2 > 3440 – but only by about 10%. And that 1440 vertical resolution of that wide monitor was significantly better than the 1200 pixels on those 24" monitors. And when you count overall pixels, that wide monitor ended up with about 7% more pixels than two 1920×1200 monitors combined. So… more pixels. IPS screen. No edge to worry about. Less than two comparable 24" monitors. My mind was already changing. I still thought the whole "curved monitor" thing was a gimmick, but I decided to give the Dell U3415W a try. It showed up a week later from Adorama – who gave me a great price and a rebate. I quickly swept the three other monitors off of my desk (my third, smaller monitor could always come back if I decided I needed the extra screen real-estate). The monitor itself comes with a variety of cables, including a mini-displayport and an HDMI cable. The bundled documentation, however, was completely unclear about which connection would be better. So I set both the HDMI cable and the DisplayPort cable up to my Nvidia GeForce GTX 760. The HDMI connection was recognized first, and looked OK – but then after doing a bit of reading up on DisplayPort, I decided to use that connection instead – which was easy to do by simply unplugging HDMI and switching the source on the monitor. It claims to come already color corrected, which wasn't a big deal for me, because I typically only do light video and photo editing, along with typical office-style work. For me – at least, it was I simply had to clear my desk of the old monitors, and fire up the new one. And it too me all of about 5 minutes to realize how wrong I was about ultra-wide curved monitors. It's not just the extra desk space, as I had that and more with my previous three monitor set. 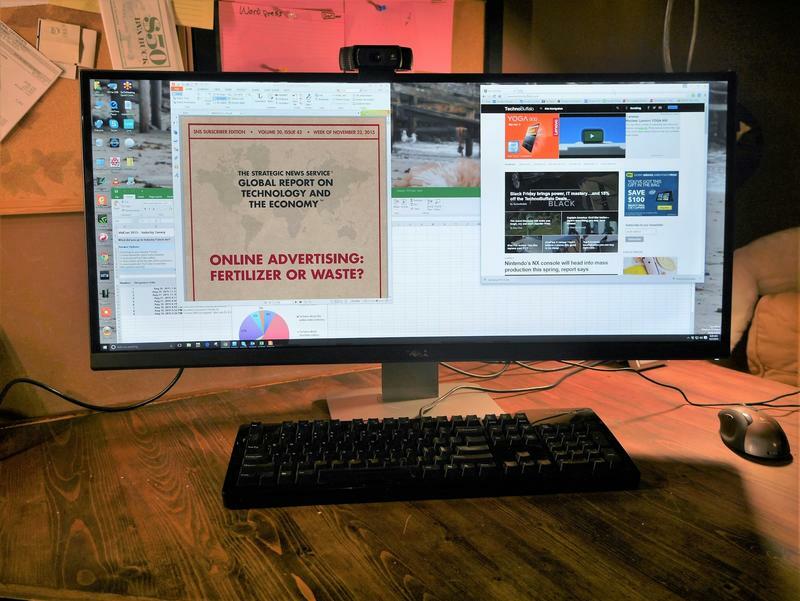 But a monitor set up without borders is significantly better than multiple monitors – even if they are as bezel-free as possible. That's because I didn't have to worry about a window bleeding across screens. And I didn't have to try to exactly line up my monitors so the mouse cursor floated cleanly from one screen to the other – when it's all one monitor, you never lose the mouse. I was worried about sharing my screen in Skype and Google Hangouts, because in with my old setup I could dedicate one monitor to be shared, while keeping email, notes and other things I didn't want others to see on one of the others. But I quickly discovered that those two services let you share just a window, rather than the whole screen, so I was OK with that as well. It also took me a little while to stop maximizing windows when I wanted to focus. Microsoft word, for example, just doesn't work well when stretched the three times its vertical height. Excel, on the other hand, took to my wide monitor setup like a fish to water – and I loved building and perusing super huge spreadsheets without losing focus when crossing a monitor border. I found video editing with Premier and cloud-based service Wochit to be similarly positive, as I could easily manipulate multiple windows – or browser instances – to help create and edit content. As for the curve, it's slight, but definitely needed for a monitor this wide. I used to wrap my three monitors in a semi-circle, and this tends to replicate that experience, although it's not as sharp. So yeah, I was wrong about ultra-wide, curved monitors. I don't think I would have pulled the trigger if they were still over $1,000. But at less than $700, it was easily one of my best technology purchases of the year. The only thing I wish it had – because I've upgraded everything to Windows 10 – is touch controls.